Last weekend-Labor Day weekend--I had the chance to reconnect with some old friends. And reconnect we did. These girls and I were suitemates our sophomore year at Wartburg. And we honestly had a blast. Of course there were fights and nit-pickings and arguments and tears, but the good things much outweighed the bad things. Things like watching Dawson's Creek till all hours of the night and singing the theme song. Picking your roommates up at 3:30 am. Always having someone to go to the cafe with. Secret Santa gifts and having a Christmas party. Late night talks in the main room. Interpretive dancing with Vanessa Carlton. Workout buddies in the main room. Some of these girls and I haven't been together since the end of our sophomore year. That's 3 and a half years. Crazy. Others I haven't seen for over 2 years. And some I saw a year ago. Not all of the roommates were able to make it, but hey 6 out of 8 ain't bad. I didn't know if the group of us would ever be able to get back together, but I am so happy we were able to. The best thing about these girls is that no matter how long it's been since we've seen/talked to each other, we are able to fall right back into our friendship, no awkward uncomfortableness. We started the weekend off right by getting some din din and tossing back a few cold ones. Of course the night included a little bit of my favorite past time, dancing. We stayed the night at our friend Rachel's boyfriend who lives in Wrigleyville. And by Wrigleyville, I mean Wrigley Field. He lives right across the street from center field. Pretty sweet, huh? I'm a little lot jealous. 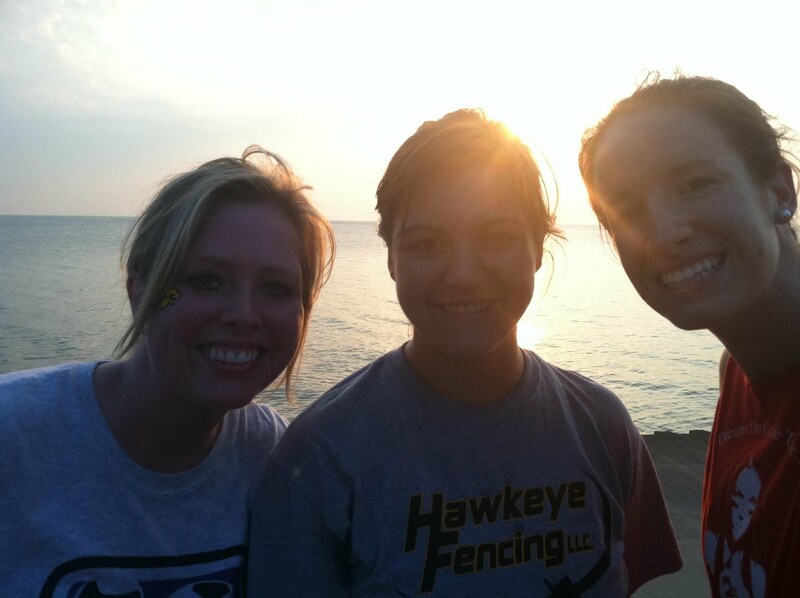 On Saturday, a few of us-Angie, Samantha, and myself-got up bright and early to go for a nice jog. It was a beautiful run as the sun came up over the lake. We ran for about 3 miles and walked a bit. A perfect start to the day. I sometimes wish I could live in Chicago just so I would be able to run on Lake Front Path all.the.time. Following the nice morning run, we all showered and got ready to go to the Cubs game! The Cubs are my homeboys. Originally, we had purchased bleacher seats, but due to some luck and connections we got free tickets to a Wrigley rooftop. Included in the rooftop is free food and drinks. Pretty sweet deal if you ask me. And the food was aplenty. There was salad, pizza, brats, hamburgers, and chips. (Most of which I had to avoid due to my meat free month For dessert, the buffet included cookies and an assortment of ice cream. You can believe, I ate my fair share. And don't worry, the free drinks weren't lost on us either. A spread of beer and wine and pop were available. I stuck with the beer. Unfortunately, during the seventh inning a little visitor appeared. He was uninvited, yet he came anyways. Thankfully, we were still all able to sing "Take me out to the ball game". Such a weird moment, but singing that with the crowd is something I absolutely love. To pass the time, we took pictures. Reviewed and laughed at other pictures. Gawked at the cute couple. And the other not-so-cute couple. Eventually we gave up on the rain and left. Then evening was finished out by playing a game of Group Therapy. A very odd game and that's all I have to say. The weekend was an absolute success.